Our only disappointment this year was the premature end that came to Beo! (www.beo.ie), an online magazine published by Oideas Gael since 2001. Beo! is recognised as one of the most successful and innovative publications in Irish of all time. We warmly welcome, however, RTÉ’s new online news service, the new online newspaper Tuairisc.ie, and the brand new Nós* website that is to be launched soon. Oideas Gael has amassed a wealth of experience and research as result of our 13 years publishing Beo! and we will keep a keen eye on the Irish language media sector over the coming months to ensure that the Irish language community is served well at home and around the world. 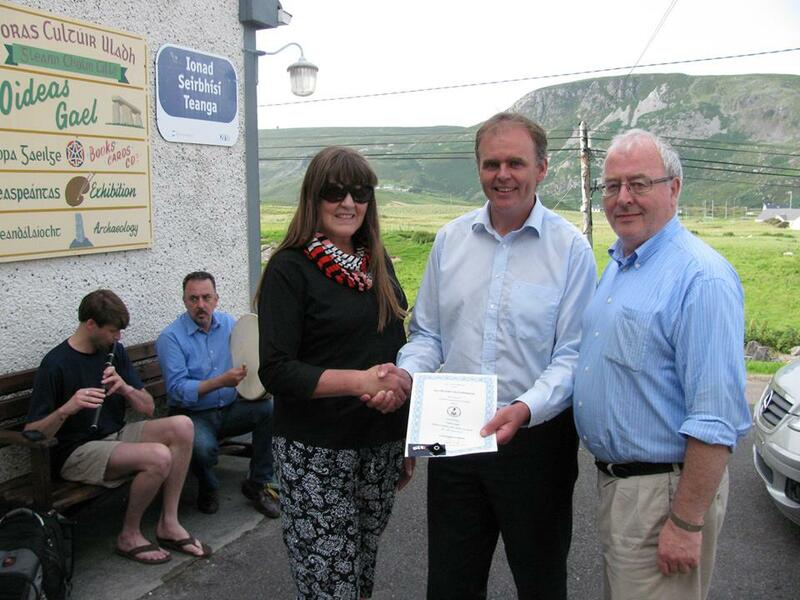 The Minister of State Joe McHugh, T.D., awards a Fulbright certificate to Katherine McCormack, 30 July 2014 – his first duty as Minister of State with responsibility for the Gaeltacht. We always enjoy the opportunity to meet our friends worldwide at this time of year. Liam was present at the Féile Interceltique Lorient in Brittany this August. This marked our first visit to the festival and it was indeed a fantastic cultural event. In September Oideas Gael teachers took part in Deireadh Seachtaine Gaeltachta San Francisco, an important event on the US West Coast with which Oideas Gael has a long-established relationship. Afterwards, Liam spoke at the transatlantic Golden Bridges conference in Boston. And, for the first time, the Irish Festival of Oulu, Finland, played host to a Deireadh Seachtaine Gaeilge in cooperation with Oideas Gael. Visit our Facebook and Flickr accounts to get a taste of this year’s events. Our courses have not yet finished for the year 2014, however. We have both a weekend Irish language course and a weekend course in Flute and Whistle Playing to come from 24-27 October, followed by a SCG/OCG Exam Preparation Course for teachers from 26 October – 1 November. As well as all this, details of our 2015 courses are available on our website now with even more info coming soon on this blog!